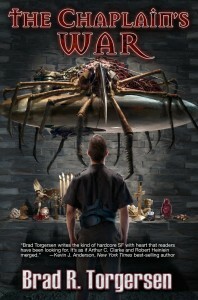 Recently, I finished The Chaplain’s War, a novel by Brad R. Torgersen. I discovered the book while killing some time at the local Barnes and Noble. The two things that first attracted me to the book was the title and the cover (see left image). At the time I was just about to leave B&N when I stumbled across it, and I didn’t have much more time to than to glance at the jacket. A short time later, as I was nearing the end of Paul of Dune by Brian Herbert and Kevin J. Anderson, I decided it to do some research of the The Chaplain’s War. Interestingly, on the cover was an endorsement by Kevin J. Anderson, so I felt the book was worth investigating further. So I did what a lot of modern reader’s do, I download a sample to my e-reader. The shell of the story is typical science fiction set in the not too distant future: Man has recently discovered a way travel outside our solar system; has met an alien life form; the aliens want humans eliminated; the aliens have far superior weapons; we are losing the battle. It is like David going up against Goliath; except this time David has spit balls instead of stones and Goliath has a force field surrounding him. 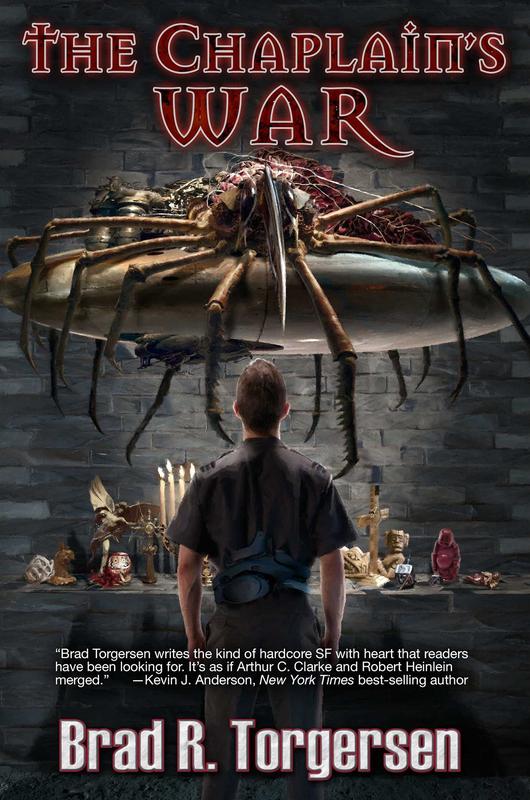 The story itself focuses on an “Assistant to the Chaplain” named Barlow captured during the war and imprisoned on the plant “Purgatory.” Barlow is not a very religious man himself, but erects a chapel on the planet honoring his superior’s last request to do so. One day an alien appears in his chapel. The alien tells Barlow he is a professor and wants to learn about religion before the genocide of the human race. The rest of the story, I discovered after downloading the entire book, is the exploration of religion and how Barlow ended up on Purgatory. Having recently reread Robert A. Heinlein’s Starship Troopers, I saw similarities between the two books . Barlow is like Rico, both enlisting in the military because of friendships and because of urgent need to fight the enemy. Both books detail their main characters challenges through basic training. However, as the story progresses, it is clear Rico and Barlow are entirely two different characters. The only reason for the similarity is both authors use basic training to help us understand their characters personalities; and what better way than having a drill instructor tear down and the rebuild up your character. The exploration of religion is not a deep theological/philosophical treatise. Instead, the discussion is more akin to a “Christian in name only” discussing religion with an atheist or free-thinker. The alien raises questions, and Barlow can only give “what he has heard” answers. He has nothing experiential to share with alien professor. The discussion also not only explores Christianity in all of its “flavors”, but other major world religions as well; carefully highlighting the differences with each. While I thoroughly enjoyed the novel, I felt the novel was a little light. I felt some aspects of the story needed more development. However, it became understandable after reading the introduction that the story originally was written for the science fiction and fact magazine Analog and later expanded into a novel. I also felt a little strange reading ruff-n-tough fighting men limiting their swearing to saying variations the 6th letter of alphabet. At the same time, it was nice not to read the f-bomb every time a soldier said anything. All in all it is a solid military science fiction story with an interesting twist with the addition of the exploration of religion. It is written in a way both Christians and non-Christians should enjoy. Previous Previous post: Nerd Men Rejoice !